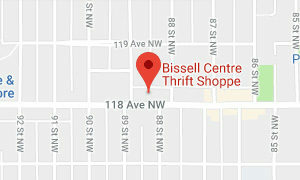 Bissell’s Thrift Shop is a neighborhood staple! Thriving off donations from the generous community, we sell a variety of clothing, accessories, art, furniture, and housewares at affordable prices. Make a Difference in Our Community! Be socially conscientious! All revenue from our Bissell Thrift Shop goes back into Bissell’s programs, which support the people in our community who experience homelessness & poverty. Be environmentally responsible! Each item donated means one less item in our landfills. And, every item purchased second-hand means one less new one produced. Be economically smart! Discover and create your own unique style from our eclectic collection of affordable clothing, accessories, art, furniture, and housewares. Sorry, we do not offer pick-up services. 2100 children and adults access clothing free of charge from Bissell’s Community Closet each year. $195,000 in annual revenue goes back into Bissell Centre’s programs & services that serve people experiencing poverty.